Tropical Storm Marty, which formed into a depression from an area of low pressure about 300 miles southwest of Acapulco, Mexico Saturday afternoon (local time), has been trying to strengthen while drifting slowly northward toward the southwest coast of Mexico. The Global Precipitation Measurement (GPM) mission core satellite, a mission managed by both NASA and the Japan Aerospace Exploration Agency, measured rainfall and cloud heights within Marty. 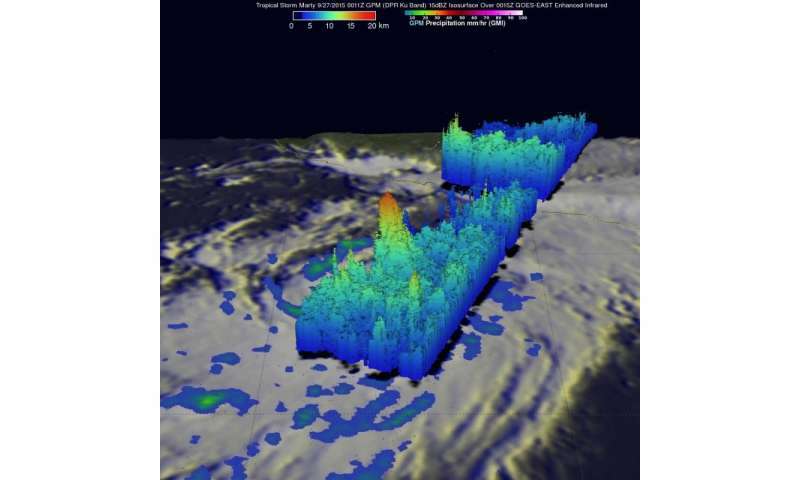 NASA's GPM core satellite at 00:11 UTC on September 27 (Sept. 26 at 7:11 pm CDT) just a few hours after Marty had formed into a tropical depression. GPM shows substantial areas of rain on the eastern half of the storm, but more importantly, there is already evidence of curvature and banding within those areas of rain, indications that a cyclonic circulation is becoming established. Furthermore, there are areas of heavy rain located near the center. A 3-D perspective of Marty was created at NASA's Goddard Space Flight Center in Greenbelt, Maryland using data from the GPM DPR instrument. It showed that areas of heavy rain near the center were associated with a deep convective tower that reaches up to 17.5 km. When these "convective bursts" as they are known occur near the cyclone's center, they can be a sign of intensification due to the associated release of heat into the storm's core. Based in part on this information, the National Hurricane Center (NHC) upgraded Marty to a tropical storm in its following advisory. On Monday morning Sept. 28 at 10:41 UTC (5:41 am CDT) GPM estimated rain rates in Marty. At that time, several prominent rainbands were clearly evident and appeared larger and more robust than the previous day, an indication that the storm was continuing to become better organized; however, they were again located primarily east of the center of circulation. This was due to the effects of westerly wind shear, which was inhibiting Marty's ability to strengthen. Despite this, the presence of yet another convective burst showed Marty was continuing to battle the shear and is at least likely maintain its strength in the short term. On Tuesday, September 29, the National Hurricane Center issued a Tropical Storm Warning for Acapulco to Lazaro Cardenas, Mexico. A Tropical Storm Watch is in effect for west of Lazaro Cardenas to Punta San Telmo. At 11 a.m. EDT (1500 UTC), the center of Tropical Storm Marty was located near latitude 16.2 North, longitude 101.6 West. Marty was moving toward the east-southeast near 3 mph (6 kph). Little motion is expected today. After that, the National Hurricane Center (NHC) expects Marty to begin a slow motion toward the west-northwest tonight and Wednesday. On the forecast track, the center of Marty is expected to be near but just offshore of the southwestern coast of Mexico today through Wednesday (Sept. 30). Maximum sustained winds have decreased to near 60 mph (95 kph) with higher gusts. Additional weakening is forecast during the next 48 hours, and Marty could weaken to a depression by Wednesday night. The estimated minimum central pressure is 996 millibars. 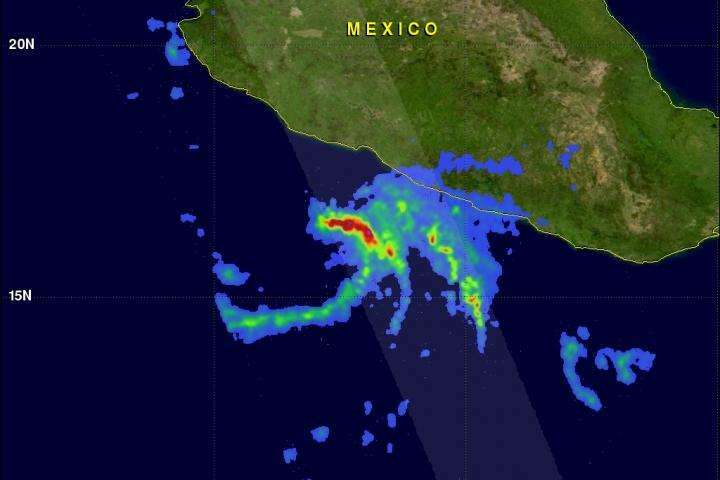 As GPM saw heavy rainfall within the tropical storm, that will be a major threat to the residents of western Mexico. The NHC said "Marty is expected to produce rainfall amounts of 6 to 12 inches over the Mexican state of Guerrero and 2 to 5 inches over the state of Michoacan through Thursday. Isolated amounts of 20 inches are possible in Guerrero from the Sierra Madre del Sur Mountains toward the coast." In addition, A storm surge is expected to produce coastal flooding in areas of onshore flow. For updated forecasts, visit: http://www.nhc.noaa.gov. NHC is forecasting Marty to continue to drift slowly towards the southwest coast of Mexico, but the center is expected to remain offshore before turning westward and weakening as a result of even stronger wind shear and colder water.